Interior, the Council Chamber; see the seats? 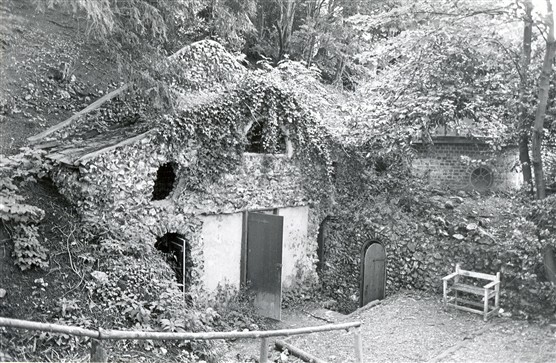 Scott’s Grotto is a well-known tourist attraction in Ware, and with good reason. The series of interconnected chambers, which extend 67ft into the hillside, constitute the largest grotto in the UK, and are a marvellous sight to behold, with tunnels lined with shells, flints and pieces of coloured glass. The most impressive chamber is the Council Chamber, which is the most lavishly decorated and has seats set into its walls. One of these seats has the word ‘FROG’ written in shells, in deference to Sarah Frogley, the wife of John Scott who built it; isn’t that sweet? The man himself, also known as Scott of Amwell, was an 18th Century Quaker poet and writer, who particularly wrote on the alleviation of poverty and pastoral verse (his Poetical Works were published in 1782). Born in 1731, he inherited Amwell House and its grounds in 1768, and when rebuilding the house and landscaping the gardens he decided to build a grotto; the one for which he is best known today. But why did he build it? What was its purpose? Was it simply because the building of grottoes was fashionable at the time? Perhaps he thought it would be an interesting way to decorate his garden; or maybe it was because he needed somewhere private to write (much like the writing hut at Shaw’s Corner). A further possibility is that he wanted an attraction to draw London society out to visit him. The fact that the visitor’s book he kept contains over 3,000 names certainly suggests this may have been the case, and if so, it obviously worked! Indeed, when it came to society, Scott was not too short of famous friends. The man and his grotto were much admired by Samuel Johnson. Johnson intended to write Scott’s biography, but died before he could do so. The translator and dramatist John Hoole was the man who ended up doing it. Scott was also one of William Blake’s patrons. In any case, his grotto, which was restored by the Ware society in 1990 and is a Grade I listed building (yes, I, the same level as Buckingham Palace or the Palace of Westminster), is a fantastically fascinating place to visit – as a matter of fact, it’s just around the corner from my house, so I can attest to that! 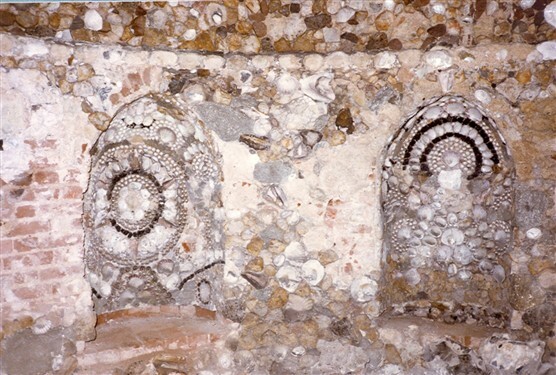 Scott’s Grotto is an amazing place; the passages are very narrow and the walls are all decorated with shells etc. It’s even got ventilation shafts reaching to the most remote chambers. It’s a fascinating place to explore. Very interesting. I was totally unaware of the grotto despite living near Ware and attending the Grammar School for 7 long years. One thing, tho’, where is it?